Hey Summer Hey! I'm ready for you! Rainy morning reviews & write ups. Not a bad situation at all here!! Whether you're an Atlanta Georgia Peach or you're somewhere else on this beautiful planet, find an Aldi Grocery Store and buy this! 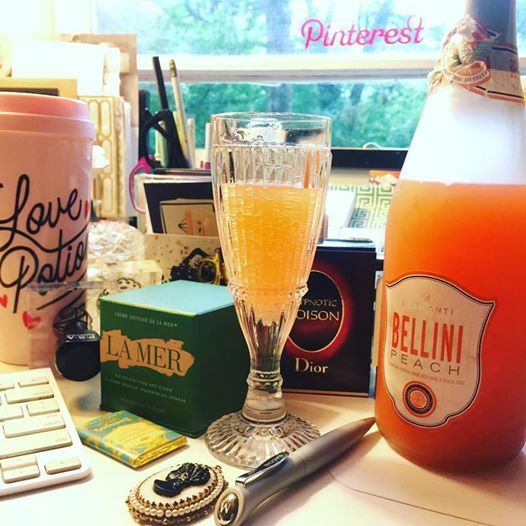 Belmonti peach bellini for a mere $5.99, all you have to do is chill, then find a beautiful crystal flute and pour! Taste like you spent a fortune!! Fruit infused with a little sparkle! There is a strawberry & raspberry flavored too! Super divine! About Aldi: If you know Trader Joes, you should also know Aldi! They are siblings! Aldi is the oldest, 40 years old to be exact! Check out www.aldi.com to find out more! Stay tune for my Chapter 2! Cocktails and Small Bites coming soon! Hooray for the Summer! Rainy days and all!